That new display features interactive video screens of two types: one has game highlights such as Joe Carter’s walk off homer in the 1993 World Series, Ken Griffey’s blast off the warehouse in Baltimore during the Home Run Derby, or Bo Jackson running up the outfield wall (which I had not seen and which is truly amazing – watch it here). The other has questions for visitors to answer dealing with such topics as whether umpires should be eliminated by electronic systems for calling balls and strikes, whether the National League should adopt the designated hitter, whether the season should be cut back to 154 games with summaries of how others have answered. It’s a good addition, and the content can be easily changed and updated. But it doesn’t have an overall theme or unifying premise. Which brings me to some observations made over my several recent visits to the Hall. I am certainly not a museum expert, but it seems to me that there are several things that could be done to enhance its mission. First, there should be traveling exhibits that go at least to the Major League cities so that a wider segment of the baseball world can see what the Hall is about. 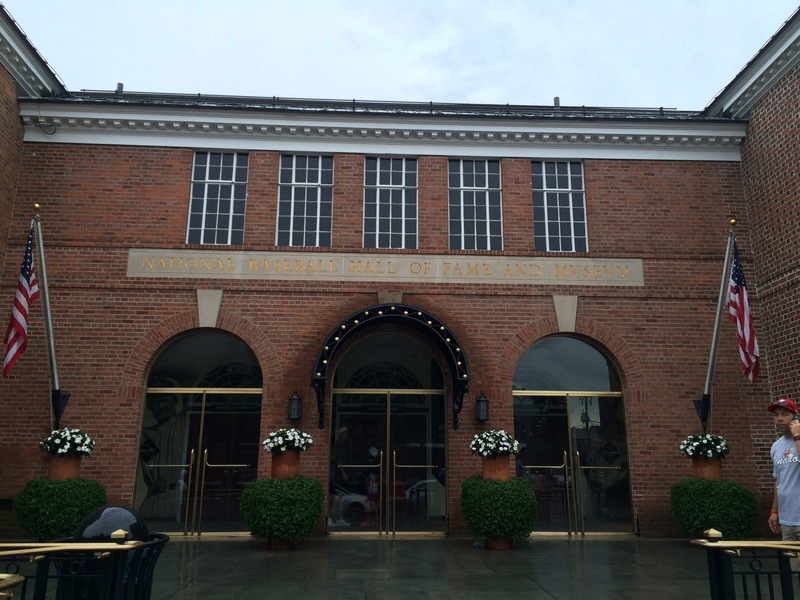 After all, not everyone can come to Cooperstown. Second, they should use interns to hang out at the Hall to talk with and record statements of visitors – people’s recollections of particular games, plays and players. I’ve overheard many such conversations and they are almost as good as some of the displays. Third, those displays should be less artifact based (e.g., here is Ted Williams’ bat or Ty Cobb’s cleats) and more interactive. They could, for example, do a 3-D simulation of pitches from the umpire’s perspective to allow the visitor to call balls and strikes. Or set up a game situation for you to decide, as a manager, whether to use a pinch hitter, call for a bunt, or send the runner. Artifacts (not the real ones) could “come to life” by having different weight or length bats for visitors to hold. Others could come up with many more ways to make the Hall more experiential. But enough of that. 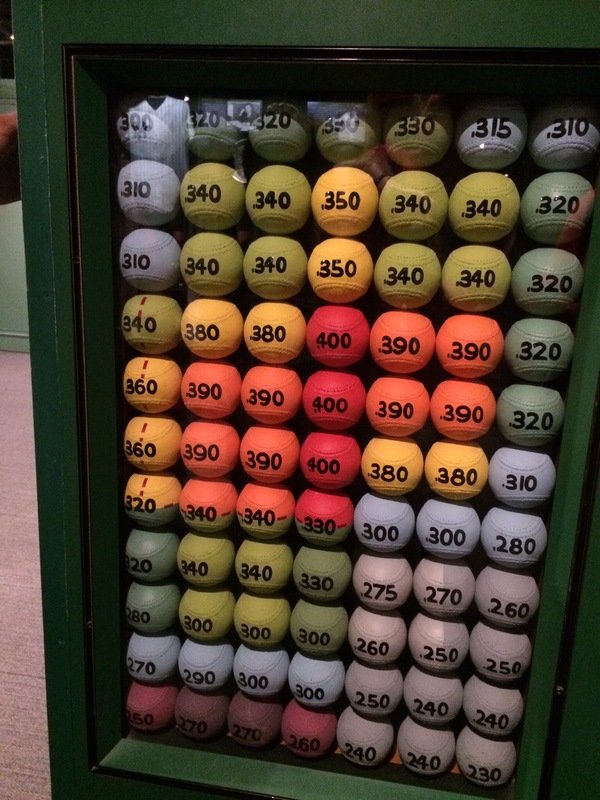 A couple of my favorites: This display shows Ted Williams strike zone with different colored baseballs, each with a batting average on it, showing what his average was when the pitch was at a particular location in the zone. It is a testament to his prowess as a hitter. 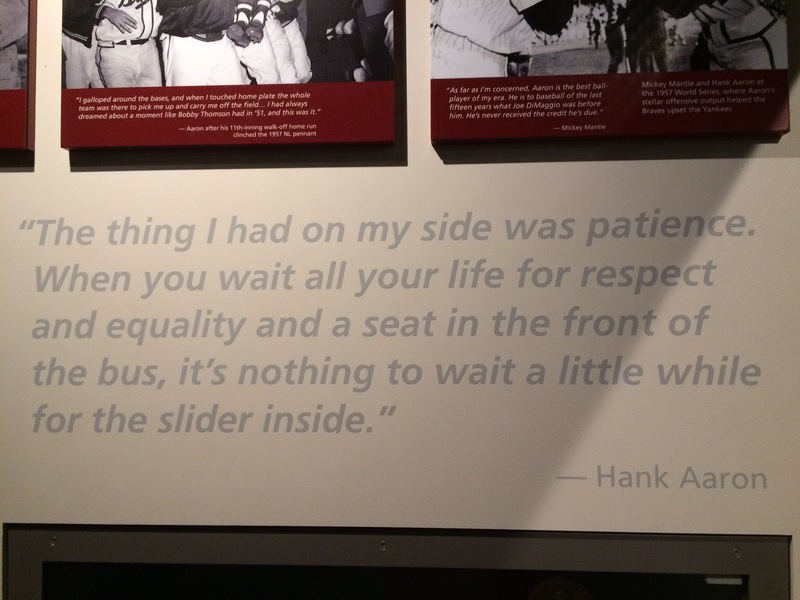 This one is a quote from Hank Aaron that gets me every time. If you visit Cooperstown, and you should if you care anything about baseball, eat at the Doubleday Cafe, right on Main Street. We’ve had several meals there and the food is consistently good, and is endorsed by locals we’ve asked. 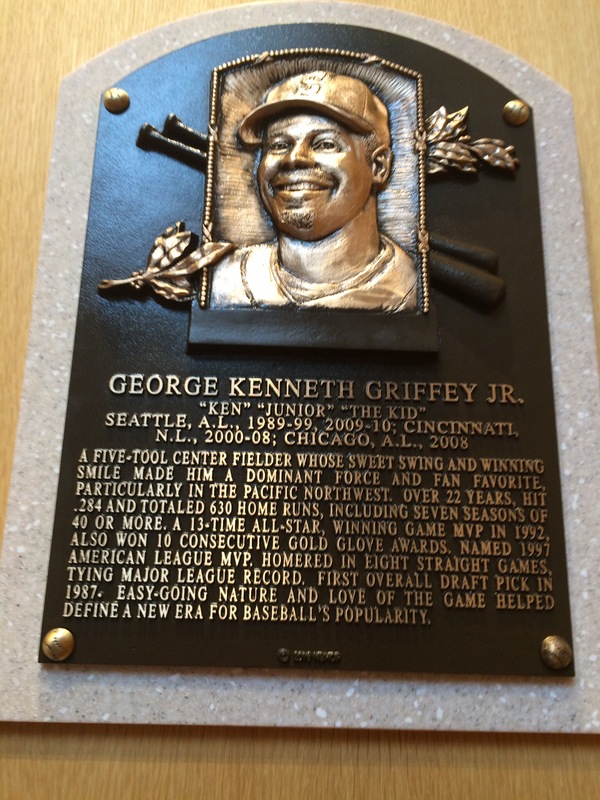 Finally, Ken Griffey’s new plaque. I want to see how far away a Ted Williams strike zone ball would have to be for it to fall under .200! Great suggestions for the museum – as usual, the world would be a better place if you were in charge.